Summer has been sorely lacking in Scotland this year but I’ve been kept going by the promise of our planned week in the sun and it absolutely lived up to my expectations. 7 days of blue skies and sunshine. Gosh it was gorgeous. This was our first family holiday abroad, my son has multiple food allergies, asthma and eczema and travelling, even in the UK can be stressful. We always self cater and usually book somewhere in close proximity to a large supermarket and familiar chain restaurants. I’m the kind of packer that would take the kitchen sink if I could fit it in the car so limiting myself to a 22kg baggage allowance and travelling by plane to an unfamiliar country where I didn’t speak the language was a terrifying proposition. It says something about our desperation for a little sunshine that I was prepared to even attempt it! 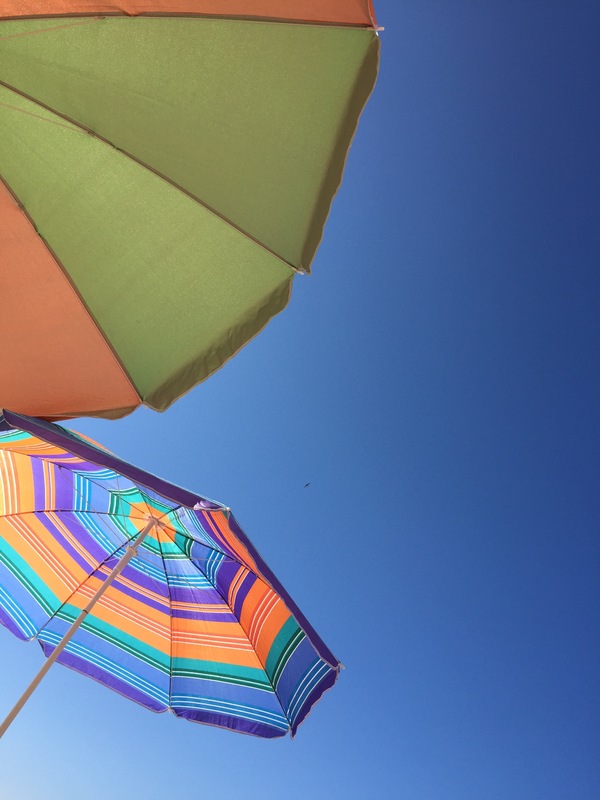 We decided on the Algarve as the weather averages looked warm but not ridiculously hot. 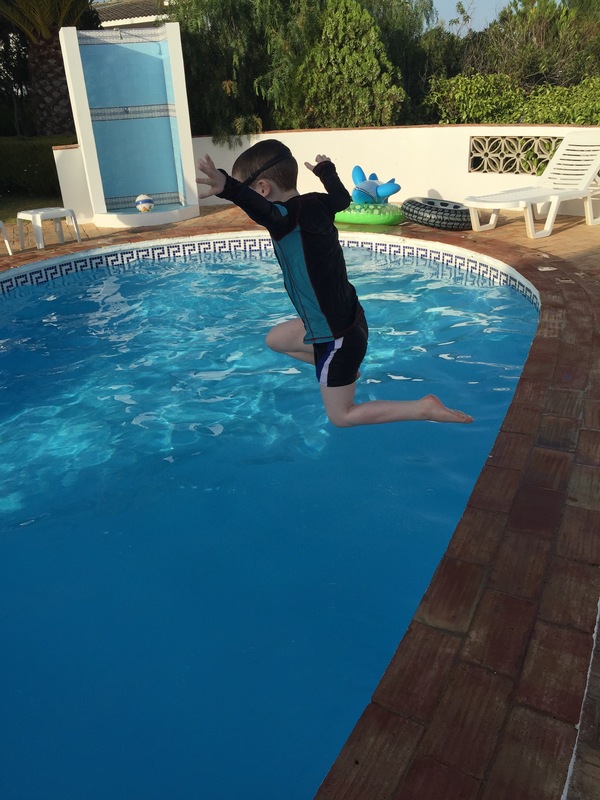 We booked a villa with a pool through VillaPlus and organised our own flights with Jet2. We were really impressed with the service from both. We also pre booked car hire for the week. In an ideal world we would not have gone mid July but with two school age children our options were limited. We decided early on that we would cater for ourselves and would not attempt to eat out on this trip. 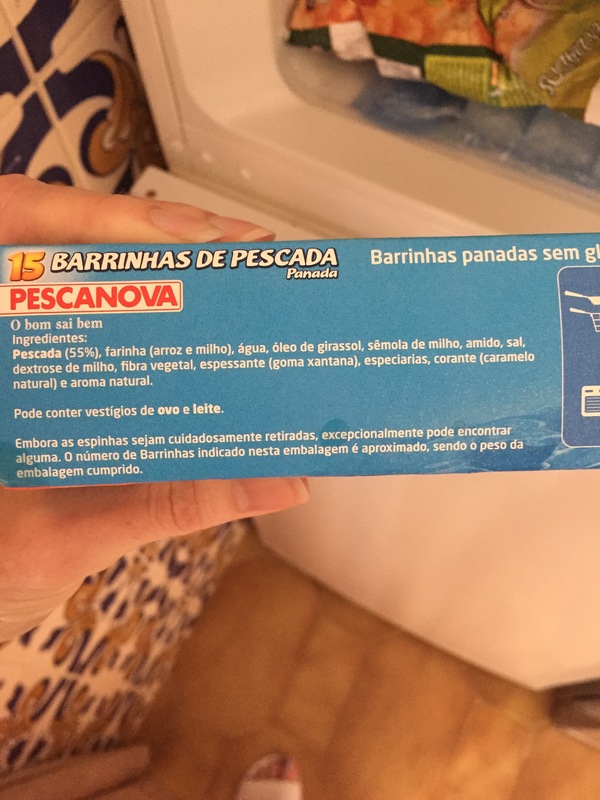 I had all the Portuguese translations for the food we avoid (Allergy Action is an excellent resource) and I knew most places would speak English but for my sanity we wanted to keep it as simple and worry free as possible. The day before we travelled I baked all morning. I made wraps, mini muffins and biscuits. I also ordered fresh rolls from Just Gluten free to be delivered that day. Along with these I packed safe sweets, chocolate, crisps, popcorn, cereal and biscuits. I took Vitalite spread and Violife cheese in a cool bag in my suitcase. Our flight was at 7.30am and we took enough food in our hand luggage for breakfast, lunch and snacks. 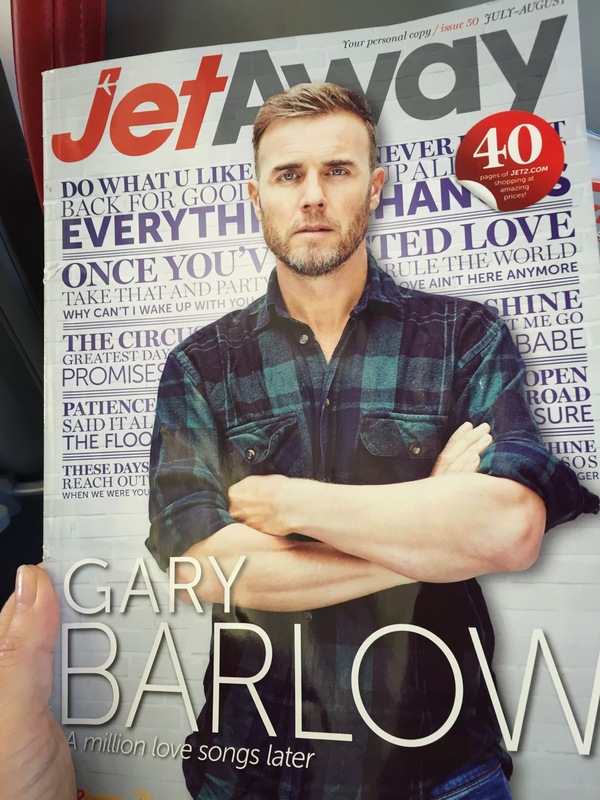 Jet2 have a clear nut policy. 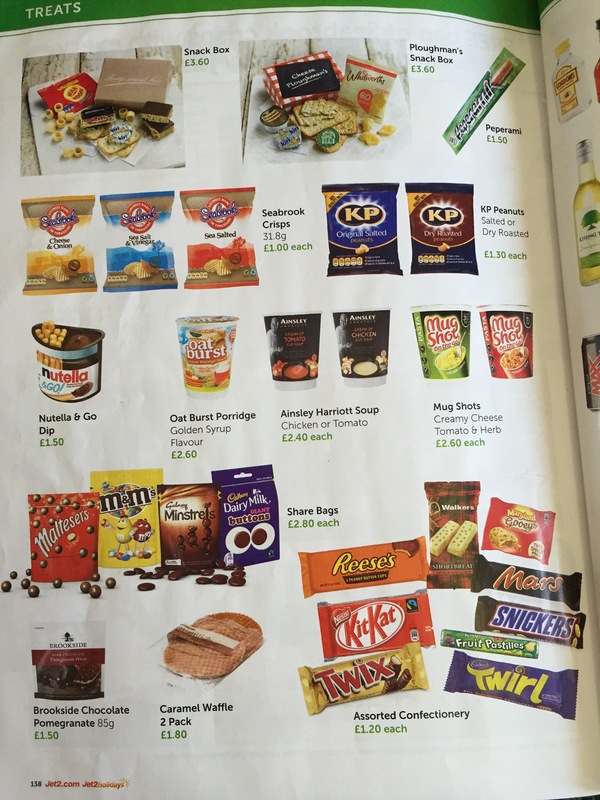 If you inform them one of your party has a nut allergy they will not serve nuts on your flight and they ask other passengers to refrain from eating any they have brought with them until they have left the plane. Staff were helpful, friendly and efficient. Check in contacted the flight crew on both flights to ensure they were aware they had a passenger with a nut allergy. I was a little concerned my son would be uncomfortable with the attention but when the announcement was made on our outgoing flight he grinned and high fived his sister! My husband overheard another passenger ask for a Snickers bar but staff politely informed them they weren’t serving nuts and offered an alternative. We stopped at a supermarket on the way to our villa but we were all tired, I was a little overwhelmed and the kids were fractious so we just bought the absolute necessities. We ended up buying food every day or so but this was not a trauma because the supermarkets were blissfully cool! We stuck to plain, simple meals – grilled meat or fish, potatoes and vegetables and cold meat and salad. 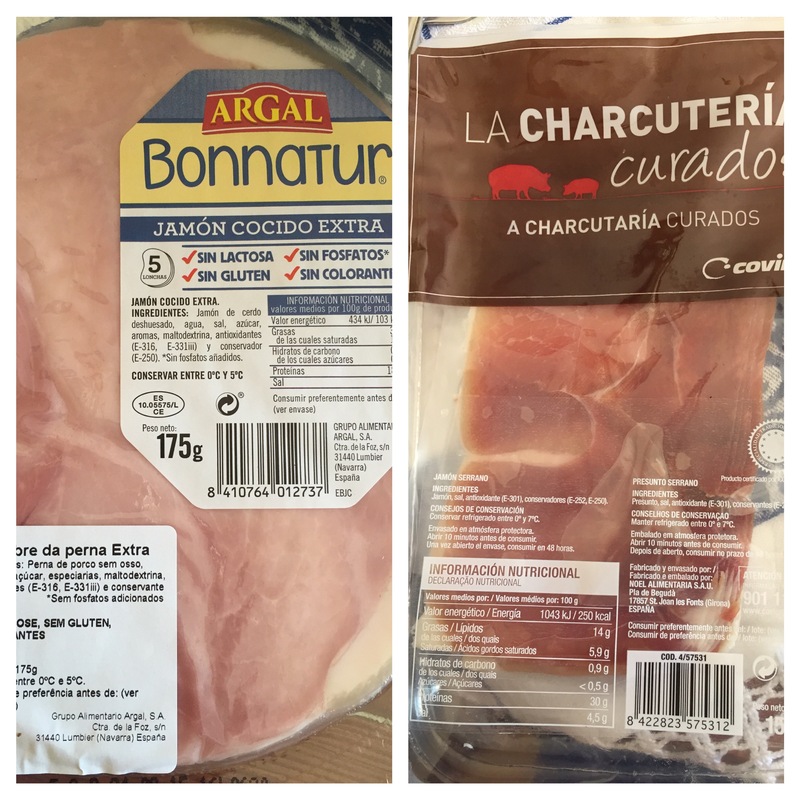 I knew what to look out for on the labels so I bought food that looked safe then went back to the villa (and wifi!) and googled every single ingredient for peace of mind. Cooked meat often contained milk but we found a couple of safe choices. I got caught out once with gluten free fish fingers. When I re read the ingredients at the villa I spotted ‘pode conter vestigios de ovo e leite’ – may contain traces of egg and milk. As a rule labelling was excellent with allergens in bold. Dairy free was astonishingly well catered for particularly if you can tolerate soya. 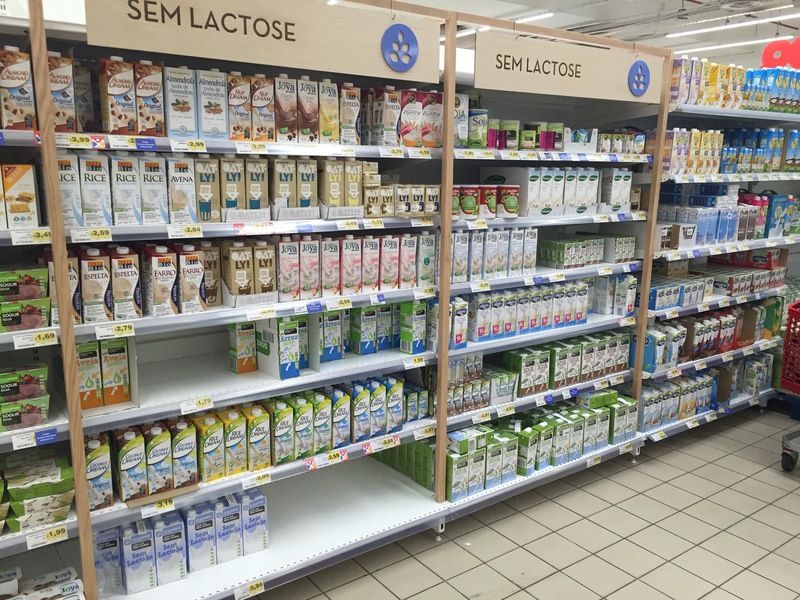 Even the little beachside supermarket in Albufeira had cartons of soya milk. The best selection was in the Continente supermarket in the Algarve shopping mall (in Guia outside of Albufeira). Soya, oat, rice, nut & coconut milk were all on sale. I bought own brand rice milk for my cereal as it was significantly cheaper than the Rice Dream. There was also a selection of small milkshake cartons – rice or soya. 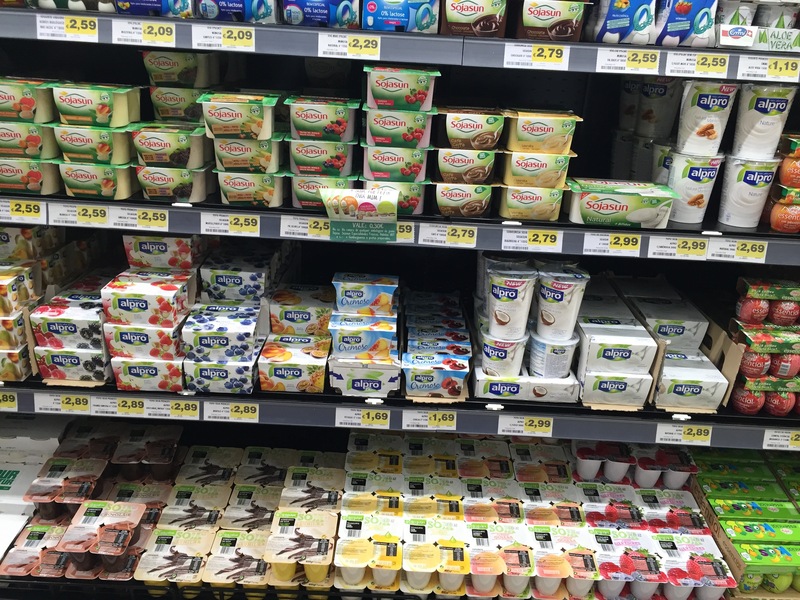 There was a tremendous selection of soya yoghurts. We bought Paturages Soja fruit yoghurts, Sojasun chocolate desserts and Sojasun prune yoghurts. I particularly enjoyed the prune yoghurts and the fruit ones were so nice the dairy eaters among us also enjoyed them! I didn’t spot any gluten free bread but I didn’t look that hard as we had safe bread with us. I did see a selection of rice cakes. I bought yummy biscuits in the Continente supermarket. 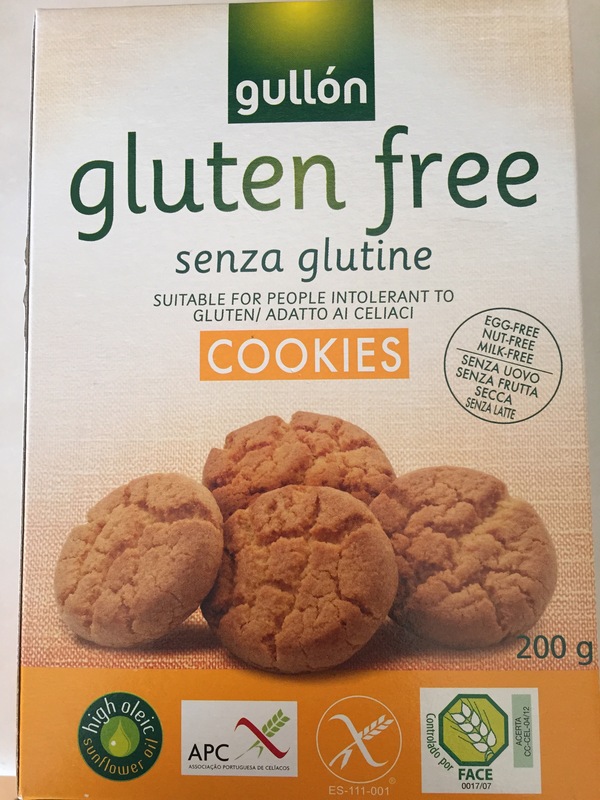 Dairy, gluten, egg and nut free! They did contain soya. My son and I liked them so much Daddy got sent back for a couple more boxes! For ice lollies we had Calippo’s when out and about (may contain traces of milk) and Mr Freezes and I made ice poles with fruit juice for the freezer at the villa. I had packed Zipsicle cases for ice lollies. I bought them in Lakeland but alas they have been discontinued. Some stores still have them in stock but they are not available online. 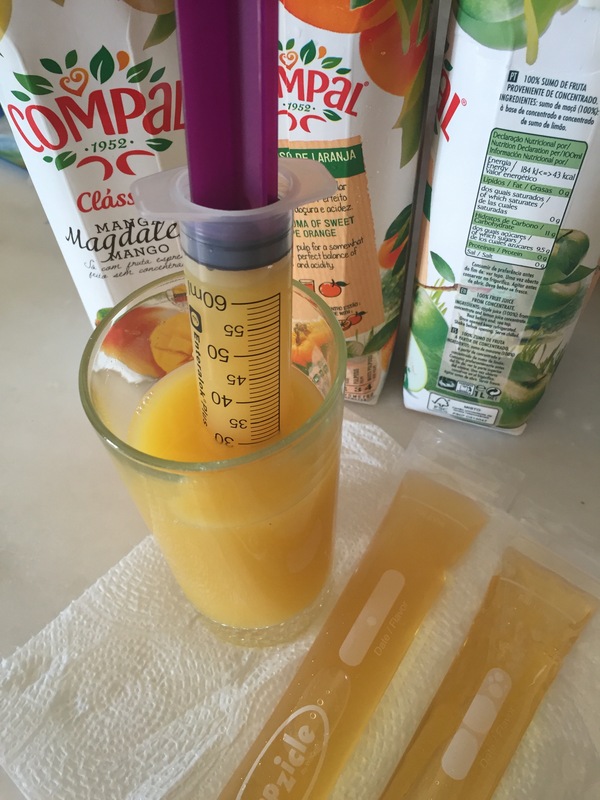 A big thank you to my friend Margaret who bought me 2 packets when she spotted some and also gave me a 50ml syringe which made filling them so much easier. 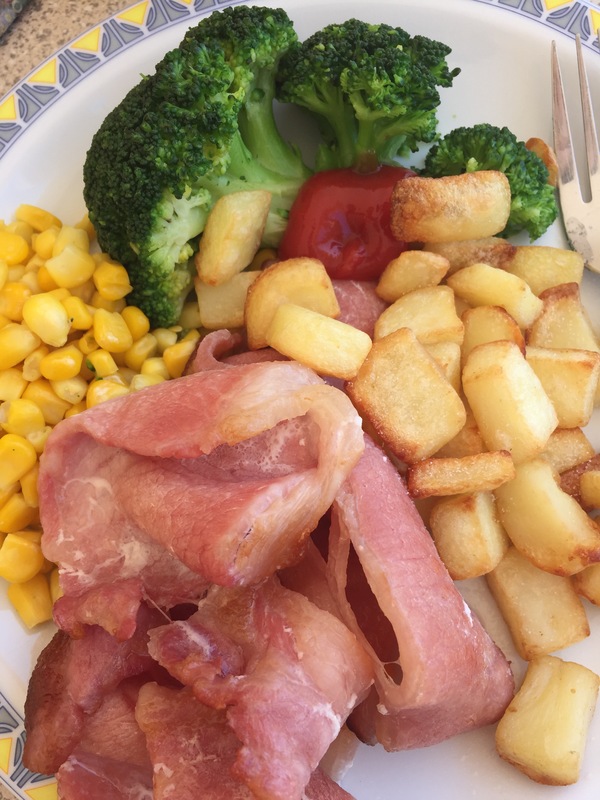 I had wondered how we would cope self catering 3 meals a day for a week and will admit to feeling a little meh about the holiday prior to leaving. Allergy mums don’t really get a break from catering but my husband saw how I was feeling and bless his heart announced he would cook all week and he did. The man is a superstar. I planned, organised, baked, packed, wrote lists, planned meals and checked ingredients but during our week away I sat with a glass of wine and supervised the kids in the pool and my husband cooked. It was fabulous. It also made me feel very affectionate which worked in his favour. Eating at home suited us well. It was crazy warm so we would have breakfast early and venture out in the mornings with safe snacks then shelter from the sun between 12 and 3/4pm with a leisurely cooked meal and quiet time with books and tablets then splash in the pool till teatime (cold meat, toasted cheese, olives, salad). I froze the home made wraps and biscuits on arrival along with the gluten free rolls and we took them out as needed. The kitchen was clean and well equipped. We washed everything before we used it and cooked with a lot of foil! It was very very hot in Portugal while we were there, 38c+ some days so we were very cautious with the sun (we are all very fair skinned). 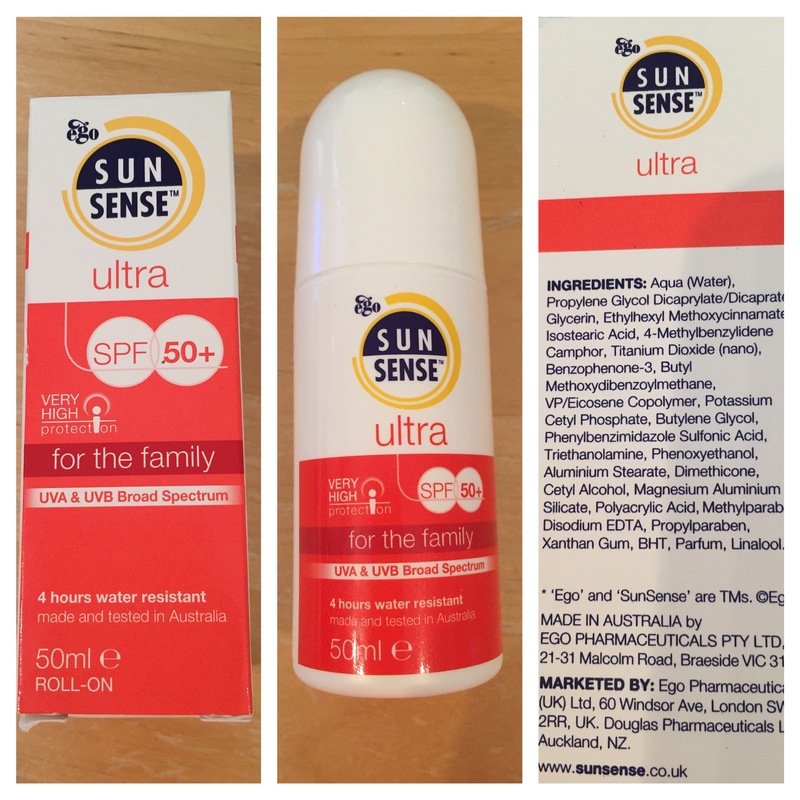 We had to be very disciplined about my son’s emollient, applying it as soon as he got up to ensure it had soaked in before we applied sun cream. We kept his Epaderm in the fridge which kept it from getting mushy in the heat. One 500g pot just lasted him the week for washing and then top to toe morning and night. He used Sunsense roll on sun cream which was a huge success. I’ve been using it this summer on the very odd day we’ve had sunshine so I knew his skin didn’t object to it. The best thing about it was he was happy to use it (my kids see sun cream as a form of torture) and was very keen to apply it himself which is a first! A 50ml roll on lasted the week (I’d packed two) but I did keep him well covered so he really only needed it on his face, neck, arms and lower legs. 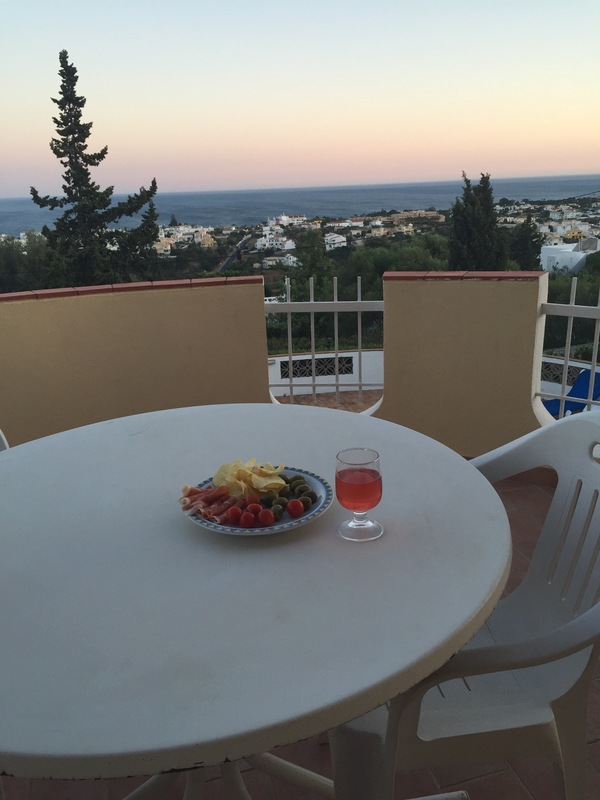 One of the loveliest parts of the day was once the kids were in bed and we sat on our balcony with a glass of wine or a cup of tea and enjoyed the peace and the view. Bliss.